Killer Characters: You Either Love it or. . .
You Either Love it or. . .
A friend invited me to bring my dogs, Sally-Forth and Tally-Ho on an unleashed nature walk on her farm. It’s not really a farm any more, she’s let it grown up over years, and has meadows and woods. While the dogs romped around, the friend stopped and looked down. She had a funny smile on her face. I followed her glance A sprig of asparagus was growing among the weeds beside our feet! She reached down and snapped it. That began us on a treasure hunt. Before long, she had a fistful of the green goodies growing wild, leftovers from long ago when someone grew asparagus nearby. She said the birds spread the seeds. I did. Because we’d snapped off only the tender tops of the stalks in the field, we didn’t have to snap it again. No pesticides or herbicides were used on it, either, so all she did was wash the asparagus and pop it into the microwave for a few minutes. The stalks were thick, tender, sweet and juicy. A feast! Finding it was fun. I suspect she knew all along where to look. We also heard a frog and saw lots of birds, including a bald eagle. What about you, what have you discovered on nature walks? You can read about how Willow solves a murder in the new Threadville Mystery, THREAD AND BURIED, available from these booksellers. Check out the first chapter here. 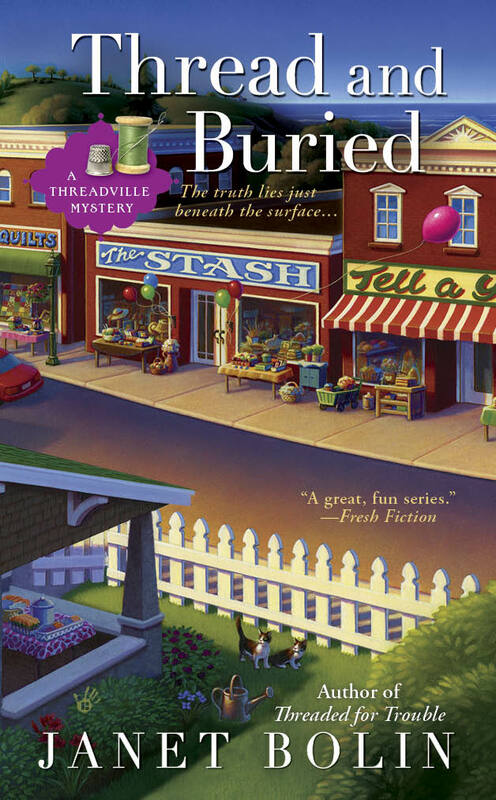 Janet Bolin’s first Threadville Mystery, DIRE THREADS, was nominated for both an Agatha Award for Best First novel and for the 2012 Bony Blithe Award. The second in the series, THREADED FOR TROUBLE, was nominated for the 2013 Bony Blithe Award. Her third mystery, Thread and Buried, is available at these booksellers. Visit Janet at facebook and twitter. One of today's commenters will be chosen at random to receive a copy of THREAD AND BURIED. Years ago we lived in a rented house, and in the woods behind we'd find single asparagus stalks now and then (usually after they'd gone past their prime). Never did know what the source was. Our area boasts a lake where there are reported to be several eagle's nests, unusual for Massachusetts. The location is closely guarded, but I'm hoping to spy one sometime. We love to go on nature walks. We like to spot the wildlife. Bald Eagles, turtles, deer, etc. And now you have given me an idea for what we can do today. Summer vacation started yesterday so I need to keep my son busy. The weather is perfect today for a nature walk. When we bought our house many years ago it was from a relocation company so we did not know much about what was planted in the yard. Imagine our surprise when the trees turned out to bear apples and peaches and the bushes in the corner ended up being blueberies. A nice surprise but ultimately a little more work then we anticpated to keep them up - as well as fighting the birds and the deer for the fruit! My favorite discovery on a nature walk is morel mushrooms. I walk on the beach and love to see what shells I might find. Mostly I have discovered serenity on my nature walks---I just look and listen to the birds and become calm. I like discovering birds and animals. I'll bet Sally-Forth and Tally-Ho enjoyed your nature walk. Surprisingly, a walk around my urban Los Angeles area sometimes turns into a nature walk. We've got lots of birds including hawks and hummingbirds, coyotes (which we fortunately don't see often but know they're there), squirrels, and deer! Just finished Thread and Buried annd loved it! When walking outside, no matter where,the best thing I find is myself. Ah, fresh asparagus! What a treat. Nature walk, what does one do when a possum and you come face to face on the same path and she/he bares his ugly teeth at you? Both of you freeze, possum hissing and you hoping it will walk away and go play dead. I must have been around 16 at the time and am always careful now coming around bends. I eventually backed up enough so the possum could get off the path. The house we lived in when I was little had asparagus that would grow up near the fence and must have been planted by previous owners. Along with rhubarb. We also had an apple tree three cherry trees and a pear tree. Loved that yard. My favorite veggie. Lots of wild beasties in our area well worth early morning or evening walk. All I have to do for a nature walk is go into my overgrown backyard. The previous owner must have loved blackberries - they're everywhere, catching us with the thorns. But this year, we have fruit! I brave the thorns to pick the berries, they're delicious! I remember one nature walk with my family when I was a kid - my mother picked a bunch of fern bracken which she cooked at home. She's Japanese, and when you cook it with some soy sauce, rice vinegar, and mirin, they're yummy. Love nature walks although I don't discover much different on them than what I see in my front yard! We have deer in our yard just about every day and a few days ago I one came right up to the front of my house and was nibbling on grass. Love seeing those girls out there! We also have wild blackberries that grow along the edge of our woods, and we share them with the birds. Birds mostly and ocean/beach life on any walk around my area on Texas Gulf coast. I walk my dog Sam and we often find tennis balls and lacrosse balls. We also come across lots of goose poop! When I was a little girl, my sister and I would take many walks in the woods - we live in rural Pennsylvania - and I can remember finding and munching on teaberry leaves, huckelberries, blackberries, raspberries, and sweet, juicy wild strawberries. They were delicious summer walks in the woods! I can't wait to read the newest Threadville story - I love that they are based in my beautiful backyard! I do find pecans sometimes on my walks, but mostly the birds have been there first. I do not like asparagus. The smell is off putting. You enjoy though. I have gone hunting for mushrooms...morels. That sounds like a fun walk, I hope the dogs enjoyed themselves as well. I don't like asparagus myself, what I do on nature walks is take pictures of the beauty I see. I just love this cover, that alone makes me want this book, sounds like a great read.